The previous post in this series can be found here. In my last post in this series I described some of the ways in which gene therapy is beginning to help in the treatment of genetic disorders. A caveat of this (which was discussed further in the comments section of that post) is that currently available gene therapies do not remove the genetic disorder from the germline cells (i.e. sperm or eggs) of the patient and so do not protect that person's children against inheriting the disease. This could be a problem in the long run as it may allow genetic disorders to become more common within the population. The reason for this is that natural selection would normally remove these faulty genes from the gene pool as their carriers would be less likely to survive and reproduce. If we remove this selection pressure by treating carriers so that they no longer die young, then the faulty gene can spread more widely through the population. If something then happened to disrupt the supply to gene therapeutics - conflict, disaster, etc. - then a larger number of people would be adversely affected and could even die. Although this is a significant problem to be considered, it is one that is fairly simply avoidable by screening or treating the germline cells of people undergoing gene therapy in order to remove the faulty genes from the gene pool. This is currently beyond our resources on a large scale, but will almost certainly become standard practice in the future. All of this got me thinking: are there any other genes that might be becoming more or less prevalent in the population as a result of medical science and/or civilisation in general? If so, can we prevent/encourage/direct this process and at what point do we draw the line between this and full-blown genetic engineering of human populations? This is the subject of this post, but before we get into this, I want to first give a little extra detail about how evolution works on a genetic scale. Evolution by natural selection, as I'm sure you're aware, is simply the selection of traits within organisms based on the way in which those traits affect that organism's fitness. An organism with an advantageous trait is more likely to survive and reproduce and so that trait becomes more and more common within the population. Conversely, traits that disadvantage the organism are quickly lost through negative selection as the organism is less likely to reproduce. The strength of selection in each case is linked to how strongly positive or negative that trait is - i.e. a mutation that reduces an animal's strength by 5% might be lost only slowly from a population, whereas one that reduces it by 90% will probably not make it past one generation. In turn, the strength of that trait is determined by the precise genetic change that has occurred to generate it. Changes in inheritable traits are brought about by mutations in the DNA of an organism's genome (except in rare instances when epigenetic effects are dominant - see this earlier post for more) that alter the sequence of genes or non-coding regions that regulate gene behaviour. Some of these mutations are deliberately introduced during the formation of sperm and egg cells (a process known as recombination), but most occur by accident. Accidental mutations like these usually happen when DNA gets damaged and then incorrectly repaired, meaning the sequence you end up with is different to the one that you started with, or when the DNA replication machinery makes a mistake during cell division. If these mutations accumulate within the same cells this can lead to cancer, but if it occurs in your germline cells then it will be passed on to every last cell in your children's bodies. Estimating the rate of mutations in humans has proved a bit tricky, but our current best guess is that any given base pair (the 'letters' that make up the DNA code) will on average accumulate ~2.5x10-8 mutations per generation - i.e. on average it will mutate once in every 40 million generations. That's pretty infrequent, but when you consider that the human genome contains ~7x109 base pairs it means that we actually each possess ~175 mutations that our parents didn't. Given that mutations can come in a variety of forms - bases can be deleted, inserted, or replaced - it's very likely that almost all of these mutations are entirely unique to the carrier and their offspring, which is something to make you feel more special! These mutations exert their effects by how they alter the sequences of proteins encoded by the affected genes. Proteins are made up of a string of amino acids, the order and number of which is determined by the DNA sequence of the encoding gene. Mutating the gene will cause the amino acid sequence of the encoded protein to change, which will then have functional consequences. Each protein has a specific set of functions that it needs to do - when you alter its amino acid sequence you will alter its ability to do these jobs, either for better or for worse. Mutations that improve protein function will confer a selective advantage to the organism, whereas those that disrupt it will convey a selective disadvantage. Over time, proteins accumulate progressively larger and larger numbers of advantageous mutations until they achieve the best possible combination of amino acids. 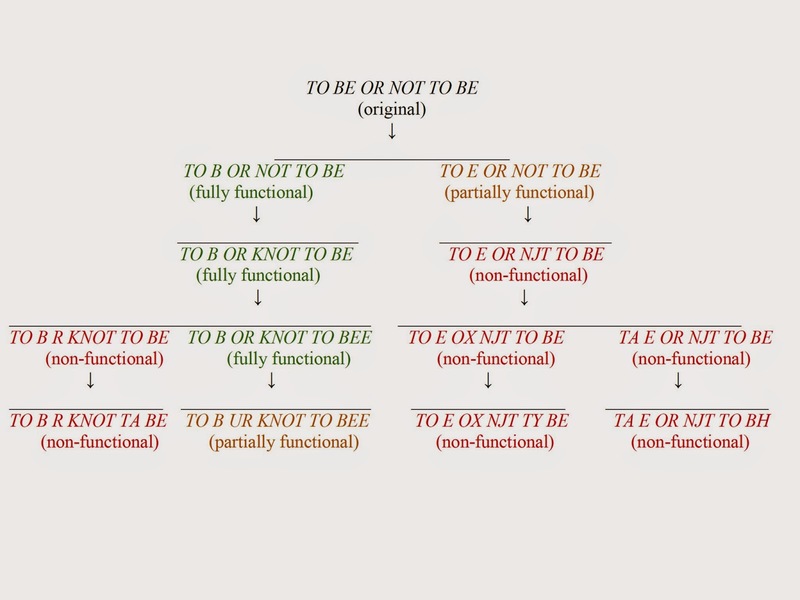 We can exemplify this process by imagining a computer program that randomly inserts 'mutations' into a sentence and then selects the results based on how close they are to the phrase "to be or not to be". Eventually the program will home in on the target phrase as deleterious mutations are lost while advantageous ones are retained. So far, I've probably just been telling you stuff you already know. However, an important implication of the molecular theory of natural selection is that the precise sequence of genes is never fixed, they just change within a tolerance range determined by selective pressures. What I mean by this is as long as a mutated gene fulfils its role as well as the original, it can replace it over time. 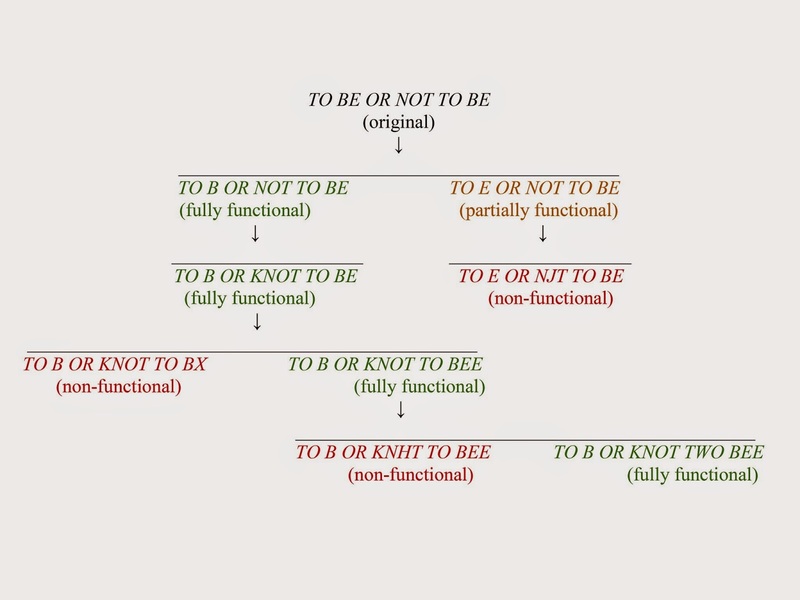 To replicate this in our "to be or not to be" scenario we just loosen the selective constraints so that we no longer select by similarity to the target phrase, but instead by how similar it sounds when read aloud. In this case, the original, functional phrase is lost over time despite being perfectly good. Mutations that have no impact on how a gene affects the fitness of the organism are known as neutral mutations. The point that I'm driving at with all this is that genes are not in any way fixed, and will always change over time within their selective tolerance limits. This is known as genetic drift, whereby many neutral mutations accumulate to change a gene drastically over time within different populations. This is best exemplified by looking at the same genes in different species - they tend to do the same jobs but can have significantly altered sequences. There are many examples of genes that have been removed from mice and replaced with their human counterparts without having any obvious detrimental effects. What genetic drift shows us is that natural selection does not need a mutation to be bad in order for it to be lost, it just needs to have no impact on the organism's fitness. The worrying implication for this is that genes can be lost from genomes simply by no longer serving a purpose, even if they are not actively detrimental. If the function that a gene fulfils becomes redundant then the window for mutational tolerance that selection imposes will become, in effect, infinite because every mutation in that gene will now be a neutral mutation. In our scheme, this would be like having no criteria for selecting the mutated phrases, and over many generations that original becomes lost completely. The mangled, barely recognisable genes that emerge from this are known as pseudogenes, and we have a lot of them! The reason why this is worrying is because there are a surprising number of abilities that we take for granted and that enrich our lives greatly, but which are not actually necessary for our survival any more due to the protection afforded us by civilisation. An obvious example of this is our sense of smell. I think we'd probably all agree that being able to smell is a good thing that we would all prefer to be able to do, but actually if I lost my sense of smell my risk of dying before having children is pretty much unchanged. In the past I would have been more likely to die from eating rotten food, not detecting predators or prey, or would have been less likely to find a mate; but none of that applies any more. Since our sense of smell has lost the protection that selection brings, it is at the mercy of genetic drift and we are losing it. Humans have a huge number of olfactory pseudogenes - gravestones for a sense of smell that was once there. We can trace this slow decline in our sense of smell back to a very specific point in evolutionary history - apes (including humans) and Old World monkeys have a much larger number of olfactory pseudogenes relative to fully functioning olfactory genes when compared to New World monkeys. This difference corresponds to the point at which primates diverged into those with the ability to see in three colours and those that can't. It appears that the species that first evolved this ability of trichromatic vision suddenly found its sense of smell to be far less important than it was before, leaving it open to be chipped away by genetic drift. It seems almost inevitable to me that our olfactory genes will continue to degrade further and further until we are eventually left with no sense of smell whatsoever. How long this will take, I don't know, but it is coming. Smell is a fairly clear-cut example of genetic drift undermining human capabilities, but there are a startling number of other similar cases. The most similar to our sense of smell is our sense of taste. The point of taste is to be able to detect what's in food - is it poisonous, sugary, salty etc. In a world where we know the nutritional content of food and rarely have to worry about being poisoned, such an ability becomes redundant and so deteriorates. A depletion in our taste abilities has also taken place recently in evolutionary history that is similar to that observed in olfaction - several of the genes encoding our bitter taste receptors have degraded into pseudogenes. Perhaps it's only a matter of time before the rest follow suit. Many other traits that may have the potential to be lost over time may be the unwitting victims of our advancing medical knowledge. In a world where we can restore lens function in the eye by laser eye function, what is the advantage of genes that prevent lenses from weakening? If we are able to reset broken bones and not die from bacterial infections in the process, where is the need for genes maintaining full bone density? Why do we need genes regulating correct heart rhythm when we have pacemakers to do it for us? As medical science becomes more and more sophisticated, we risk relying more and more heavily on our technology and less on our genes. The idea of a slow decline in human health and/or ability due to natural selection has been around for over a hundred years and is known as dysgenics. It has inspired many science fiction writers to imagine dystopian futures populated by our subhuman descendants. The most alarming of these tend to describe worlds inhabited by morons after human intelligence took a nose-dive, such as in the excellent film Idiocracy. Although a world full of idiots is not evolutionarily feasible (intelligence would remain a selective advantage in such a world as a clever person could exploit and outwit all the morons), it could be possible that some elements of our intelligence may become diminished over time. What we call 'human nature' - our inherent ways of thinking, feeling etc. - has evolved under the selective pressure to protect ourselves and those related to us. We have instincts for danger, a concept of fear, a distrust of the unfamiliar because these things helped our ancestors to survive. If our world continues to become increasingly safe and sanitised (and our medical abilities increasingly effective) these may too become obsolete. Our capacity for altruism evolved because if we protect and help those around us we optimise the likelihood for survival of others with our shared genes (including those for altruism). In today's multicultural, dynamic society many of those we help are not likely to be closely related to us, and maybe don't need our help anyway, so perhaps altruism has also become evolutionarily redundant. It's not all bad news, though, our tendency towards racism and tribalism also evolved from a need to protect our own genes, so hopefully they will degrade as well. As I mentioned earlier, our best bet for preventing the spread of genetic disorders in the wake of successful gene therapies is to screen patients' germline cells for their genetic defects. This is fairly straightforward when there is just one gene your interested in and you know who to screen. It seems unlikely that we could screen the entire population for potential genetic disorders in every gene in our genomes. And even if we did, what constitutes the 'correct' sequence for each gene since we all have marginally different versions anyway? Realistically the only way to maintain genetic integrity in the long term would be a programme of active genetic modification and/or human cloning that periodically 'resets' the genomic clock to the sequences we have today or from some future time before our abilities degrade too far. This would be an extreme step and is rife with ethical and philosophical questions. Not least is the issue of where to stop with that. Why just reset our genomes to our current standards, why not replace some of our defective olfactory or taste pseudogenes with functional equivalents? Luckily, no matter what we decide to do, we at least now have a definitive record of the sequence of the human genome and so can track the changes as they occur. As far as future geneticists are concerned we are pretty much at time zero for the genetic clock since this is where their complete records will begin. Perhaps in 10,000 years time they will be using our genomes as the template from which they can rebuild many of our lost abilities, perhaps leaving out some of the more undesirable ones. Hopefully this will allow us to remain recognisably human, although our definition of what constitutes 'human' may also have changed. Perhaps they will be happier with their new physiology and look back at ignorant bloggers who foretold disaster with derision. Either way, we are going to change, but at least we no have the understanding and ability to track the changes and, if we want to, reverse them.